This Is Who We Are – Joining Scotland and Canada in Photographic Conversations » This is who we are November 2009 and beyond. This is who we are November 2009 and beyond. The ‘The this is who we are exhibition’ is now in the lobby of the Scottish Parliament and will run until 30 November when it finishes with a reception hosted by First Minister Alex Salmond and Presiding Officer Alex Ferguson. James Wright, Canada’s High Commissioner to Britain, will also be in attendance. For a preview of some of the images and text from the exhibition, click here. Exhibitions are, by nature, selective and, delighted though we are with this one, it can only show what appears above the water. 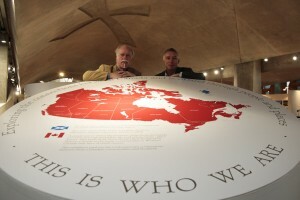 The images, text and video testimonies which appear in the exhibition are supported by thousands of new connections with Scotland that the project made in Canada. They have also been the subject of sustained and positive media attention on both sides of the Atlantic. The project received coverage from CTV in Canada, National Public Radio, BBC across America, and numerous newspapers across Canada. In Scotland it was covered by the Herald, Sunday Herald, Evening News, Sunday Post, and Border Telegraph to name but a few. The Parliament exhibition was “Pick of the Week” in the Sunday Times Ecosse reveiw section. Using a formula supplied to us by Alex Orr at Indigo PR in Edinburgh, the media value of the project has been assessed at well over £200,000. The value of the new and renewed contacts made between Scotland and Canada are probably incalculable. ‘This is who we are’ is a unique form of Scottish diaspora engagement. In Canada it involved people from every walk of life and every kind of community. We are now actively seeking support to take the exhibition to Canada and reinitiate the project in the United States and, from there, to other countries to which the Scots have emigrated in significant numbers.